Banana Burfi is one of the sweet recipe which is very easy to prepare and also very easy to make or cook. Here you can get the step by step preparation of the “Banana Burfi” Recipe which is also called “Kadali Burfi” in regional language in Odisha. Ok, see below to know the ingredients required for the “Banana Burfi” recipe and how to prepare this food. First mix all the ripe Bananas. After that mix the milk in to the Banana mix and heat the mix till the milk will disappear. Then add the ghee to the mix and mix them well till the color will be light red. Then add the Scrubbed Coconut, Scrubbed Akhrot and Sugar in to the mix and mix all then well. Then put off the mixture from the gas and make the mixture to cool. After that cut the coll mix into small pieces like Burffi and serve them. 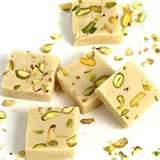 Give Responses for "How to make Banana Burfi – Kadali Burfi"